I was looking for a festive photo to start the new year. 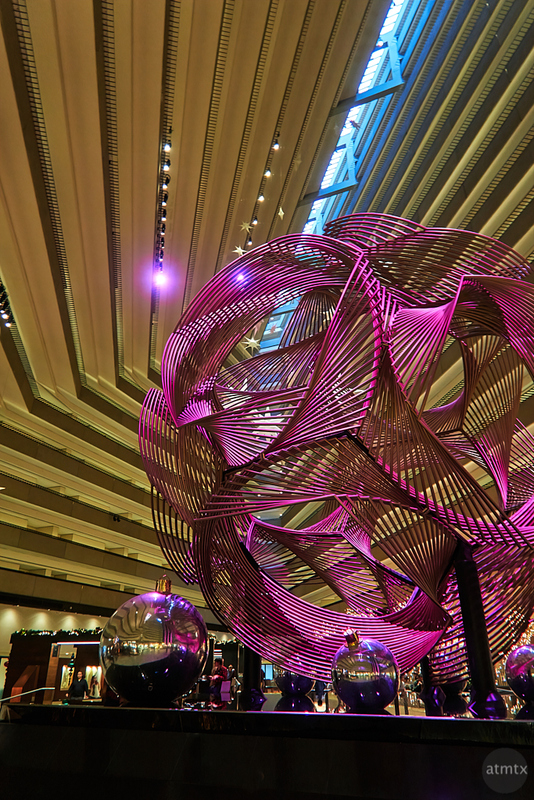 This is the Hyatt Regency in San Francisco, which I visited with my family, last week. Despite the end-of-year downer, 2018 was a good year. But my unexpected surgery and the passing of the family dog are reminders of how quickly things can change. It’s important to spend time with family and friends and to do things that makes you happy. I’m lucky that my creative energies are being nurtured through my photography and blogging. I am happy to report that in 2018, I bought no new cameras or lenses. I know this is normal for most people, but my history has been a blur of new equipment acquisitions. I can’t claim that G.A.S. (Gear Acquisition Syndrome) is licked, but it’s under control. For 2019, however, I have thoughts of a new camera. A topic for a future post. I think I overcame the industry’s propaganda to convince me of full frame mirrorless. I have no plans to get a Sony A7 series, Canon EOS R, Nikon Z or even Panasonic S1R. My two weeks in India and Singapore and my recent one week visit to San Francisco have proven that my Olympus micro 4/3 cameras have the best image quality to portability ratio of any system. I was able to make the shots I wanted with my compact, travel friendly system. I’ve been quietly dabbling with output throughout 2018. I have yet to talk about it on my blog, but perhaps I’ll go into it in 2019. What do I mean by output? I mean the printing of pictures, but in multiple different sizes and mediums. There is a surprising variety. While large LCD monitors look great, there’s nothing like having physical, tactile representations of your photos. In 2019, I’ll continue my transition towards emotive imagery and not worry about ultimate image quality. If done properly, I suspect the importance of gear will continue to diminish. I’ve been doing photography long enough to realize that the camera manufactures play on the “image quality” fears of the less experienced. It’s not great image quality that makes the photo, in most cases, it’s the emotion that it invokes. May you have a happy, healthy and creative 2019.